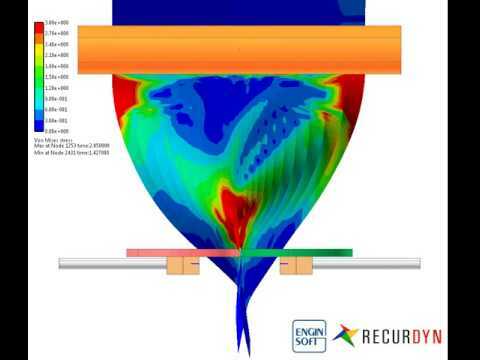 RecurDyn is a Computer Aided Engineering (CAE) software focused on Multibody Dynamics (MBD), with extended multiphysics capabilities. RecurDyn combines the power of an optimized recursive solver with superior contact technology, providing best-in-class simulation performances. The effectiveness of RecurDyn really comes out when approaching large-scale multibody models, including multiple contacts and flexible bodies. RecurDyn has Communicator modules which allow it to interface with other softwares. RecurDyn features Toolkits which are optimized for various applications across many industries. 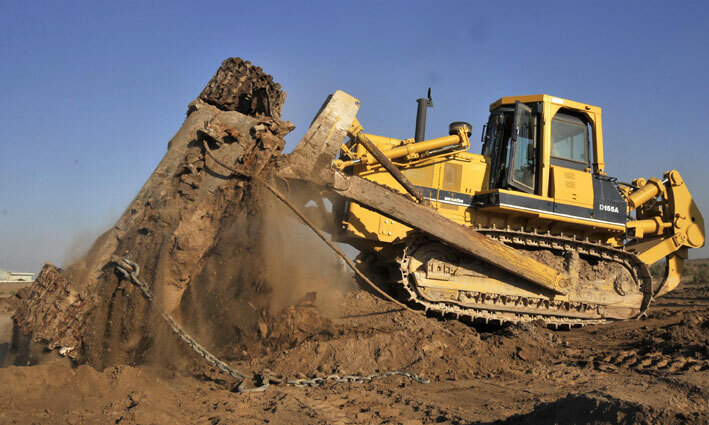 Tracked vehicles such as construction and agricultural equipment, as well as military vehicles. Fuel injectors are subjected to extremely rapid movements due to the necessity of spraying the fuel in the combustion chamber in less than a millisecond. A multibody model has been developed using RecurDyn to study the high-speed dynamical behavior of the injector during a typical working cycle. The model contains both rigid and flexible bodies: the pin is modelled using the proprietary Full Flex technology which includes a finite element body in the dynamical simulation. This choice allows to evaluate the influence of the flexibility on the body motion and to calculate the stress on the component. The spring is modelled using beam elements to correctly represent the inertial properties and the contact between the coils. All these elements create a reliable numerical model which can be used to evaluate the position of the bodies and the contact forces between the pin and the housing in order to predict the performances of the injector. RecurDyn offers unparalleled performances when solving the dynamics of flexible bodies interacting through contacts with other bodies. In this example these features have been tested simulating the motion of a very thin plastic film (32µm) dragged by two rollers. The film is connected to a tensioner and pulled by two rollers which fold the film to perform the first step of a forming process. The film has been meshed with shell elements using the proprietary Full Flex technology. 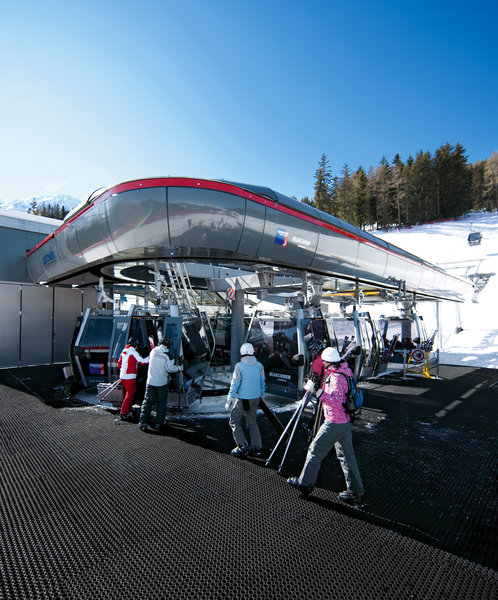 The position of the film is controlled by contacts only (the connection with the tensioner is the only exception): flexible-to-rigid bodies contacts have been used for the contacts with the rollers whereas flexible-to-flexible contact is used to represent the film self-contact. The model is used to evaluate the dynamic behavior of the film during the forming process and to evaluate the stresses caused by the process. Multibody simulation is the best technology to analyze the dynamic behavior of safety circuit breakers. 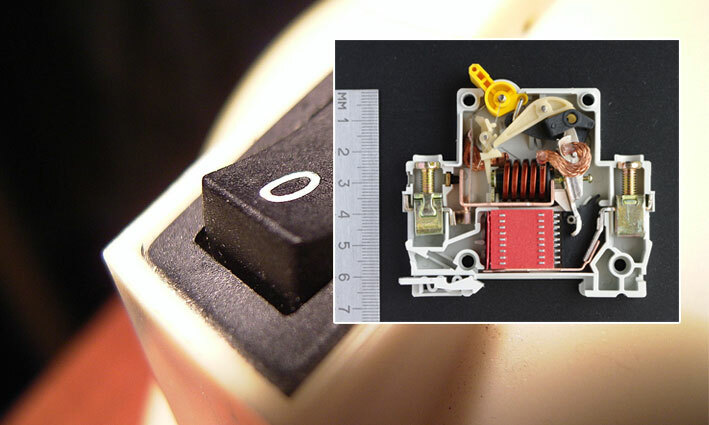 These mechanisms are characterized by high speed dynamic motions: to prevent damages the switch from on to off position must occur in a few milliseconds. The premium software RecurDyn has been used to simulate a Double Pole Single Throw Switch with three different modelling schemes: the first model uses rigid bodies and joints, in the second model the joints have been replaced with contacts and in the third the main components of the switch have been modelled using flexible bodies. The comparison of the results highlights the influence of clearances (second model) and flexibilities (third model) on the commutation time and commutation force, providing useful information for the designers. Studying the dynamics of cam mechanisms is crucial to obtain reliable, efficient and fast machines. RecurDyn offers the possibility of studying complex cam mechanisms to calculate positions, velocities and accelerations, to evaluate possible interferences and to obtain the loads acting on each component. In this example a gluer machine has been studied using RecurDyn: the cam has been represented using a 2D contact, the bodies have been considered rigid at first and then they have been also modelled as Full Flex bodies to evaluate the influence of flexibilities on the machine performances. The model provided useful information to optimize the cam profile, to evaluate the overall motion of the mechanism and to obtain the loads later used to perform the structural verifications. 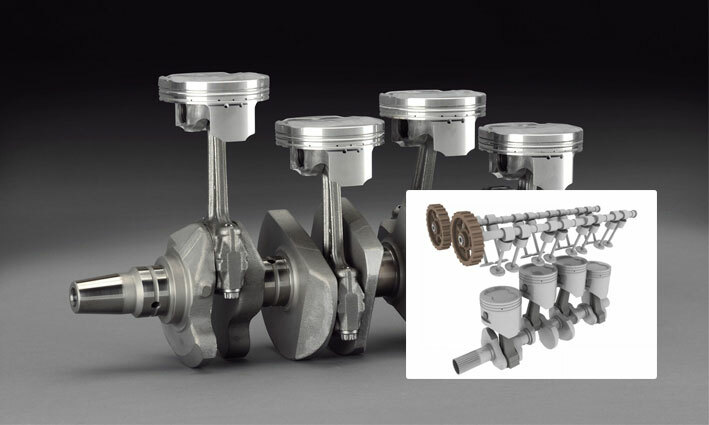 A four-stroke engine has been deeply analyzed through detailed multibody dynamics simulation. The real engine components (including engine block, piston, rod and crankshaft) have been imported as flexible bodies and assembled. Efficient contact technology allowed a realistic simulation of kinematic joints with clearance between the coupled parts. A fine representation of the experimental engine loads completed the engine model. A so-defined model offers precious outcomes: the contact analysis provides detailed information about pressure and friction between the parts, useful for wearing estimation. Also, joint clearances and bodies flexibility allow the precise detection of excessive part deformations and stresses or unwanted system vibrations. Moreover, special purpose components (e.g. elastohydrodynamic (EHD) bearings) can be easily modeled with RecurDyn’s feature package dedicated to engine and powertrain simulation. A client was willing to evaluate the dynamics performance of a new concept forklift, then a fully-functional multibody model of the forklift has been built by assembling the client CAD geometries. The forklift wheels has been finely represented with sophisticated tire features, implementing a sophisticated tire model calibrated on experimental data. Moreover, the interaction between the forks and a real freight was simulated thanks to efficient contact features. 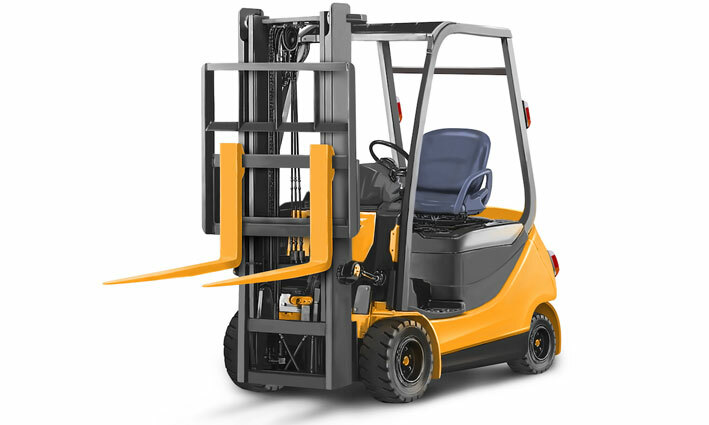 A so-defined model can be used to simulate many different scenarios: for example a crucial handling test can be performed by simulating the loaded forklift running against a standard obstacle. Various load cases and driving maneuvers can be set up in order to assess the forklift static and dynamic stability; furthermore, the loads affecting each forklift part can be measured and used as input for structural and fatigue life verification. RecurDyn offers a dedicated toolkit to pre-process, solve and post-process problems involving flexible media. The toolkit is therefore the best choice to analyze printers, copiers and other sheet feeding machines. The final portion of the paper path of a laser printer has been studied using the Media Transport Toolkit to evaluate the influence of the corrugating roller which is used to corrugate the sheet to keep it straight before falling into the tray. The toolkit leads to significant advantages during both the pre-process and the post-process: the creation of the entities is automated to simplify and speed up the pre-processing (e.g. the joints connecting the rollers to the frame and the contacts between the rollers and the media are automatically created). In the post-processing environment special results are available such as the sheet position, velocity and acceleration. RecurDyn Media Transport Toolkit proved to be an efficient solution to study problems involving flexible media. RecurDyn offers two toolkits completely dedicated to tracked vehicles. One is dedicated to low mobility vehicles (i.e. low speed vehicles) whereas the second one to high mobility vehicles (i.e. high speed). In the present example a tracked bulldozer has been simulated to evaluate the dynamic behavior of the vehicle on different terrains and obstacles. The model can be used to calculate the loads on the vehicle structure and to analyze in detail the forces acting between the links. The toolkit contains several entities which can be automatically included in the model and personalized based on user data. Furthermore RecurDyn solver offers unparalleled performances when solving this kind of problems, delivering reliable results in short time. 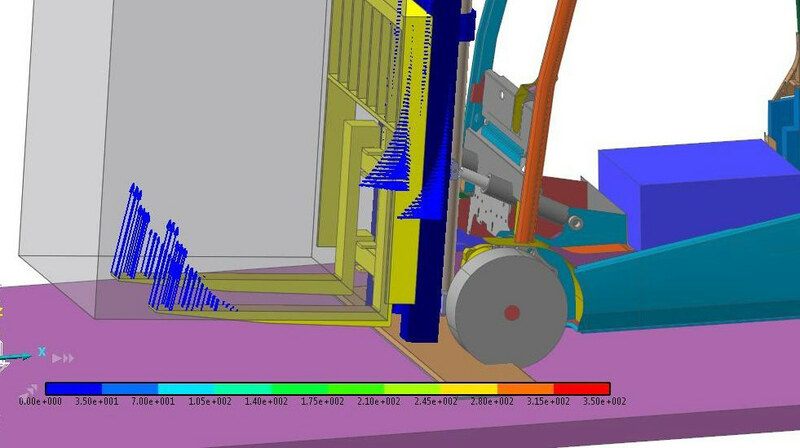 A multibody model of an excavator has been developed to calculate the loads acting on the structure and perform the static structural verifications of the components. Furthermore, the influence of the flexibility has been taken into account by using both the Reduced Flex and the Full Flex approaches. 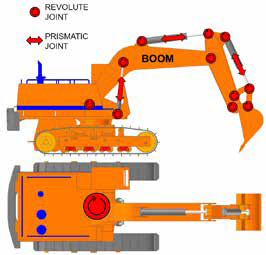 The developed model can be used to perform the sizing of the excavator components (e.g. hydraulic cylinders, slew ring, hydraulic pumps), to evaluate the motion of the machine, to simulate particular loading conditions and to obtain the forces/moments acting between the different bodies. The calculated loads can then be used to correctly perform the static structural verifications taking into account both the inertial effects and the external loads effects. Furthermore, the Reduced Flex and the Full Flex models provide indication of the stresses on the structure, which can be used to perform a preliminary sizing. 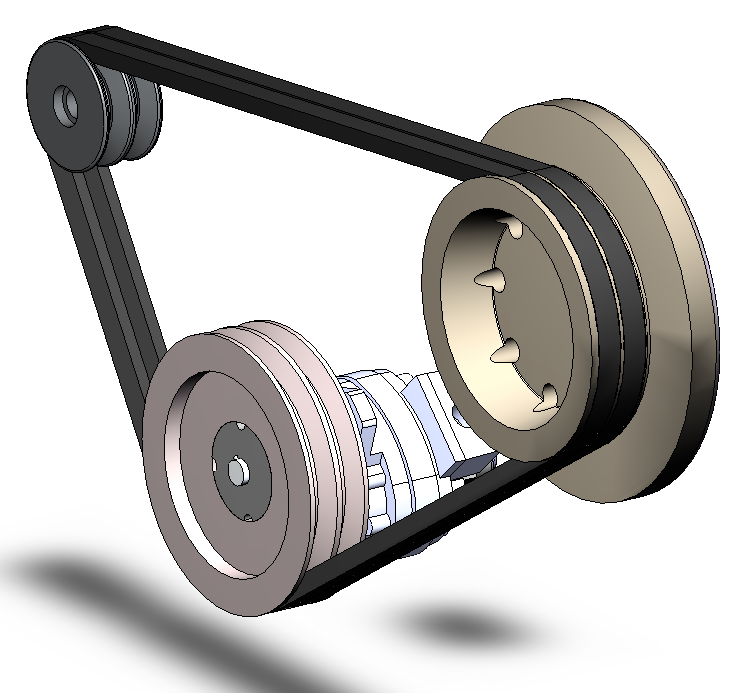 EnginSoft has developed in collaboration with MARIO FRIGERIO a multibody model of a stranding machine. Stranding and closing planetary machines are huge equipment conceived to twist, at noticeable speed, multiple heavy spools of strand, in order to manufacture large section steel ropes. The model has been developed to identify the worst operating conditions, to choose the right electric motors, to verify the braking system and to obtain the sizing loads for all the parts of the machine. The final user of the machine will be allowed to manufacture different types of rope, by combining different strands in different manners. This means that the machine can be loaded by spools having different size, different position in the main rotor, different level of unbalance, and different twisting speed. The problem has been approached through a Design of Experiments which analyzed 64 different load cases to identify the worst operating conditions. The collaboration has provided reliable results in a shorter time, while preserving the unparalleled MARIO FRIGERIO’s level of quality.